Dear Friends ,As you all know IB ACIO exam 2015 is held on 22-Feb-2015 So you all are waiting for Collection of Important Question of General Knowledge for the Upcoming IB Exam 2015. 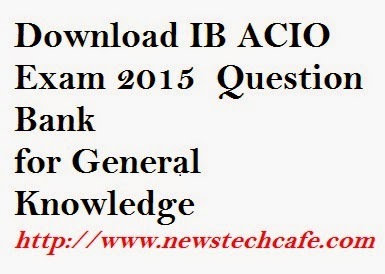 We are sharing you some important questions for IB ACIO exam 2015 which will proved to be very useful for you please download it from below link and read it carefully. Dear candidates i am sharing collection of some important General Knowledge questions with their answer in our pdf.